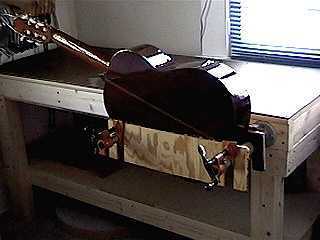 Here's my old guitar body vise, now attached to my new bench! 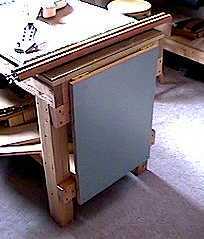 This is the vise, when attached to the bench. 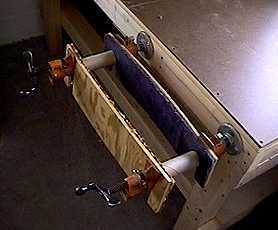 It's made up of two pipe clamps, two 12" pieces of 3/4" pipe, two 1/2" plywood jaws lined with carpet, and two toilet paper rolls to protect the guitar body from the pipe (better yet, some pipe insulation would also work!). 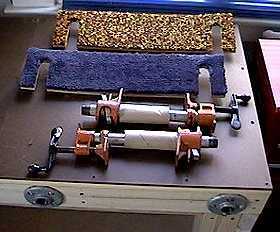 To the left are all the separate parts that make up the guitar body vise. I have attached two pipe flanges (16" apart) to the bench. When I need to use the vise, all I have to do is pull out the parts and attach them to the flanges. When I don't need the vise, everything is stored away! I got tired of having to clamp a board to my bench whenever I needed some clamping room underneath, so this is what I did. I used some leftover laminate from my kitchen countertop and attached it to my bench with a couple of hinges. 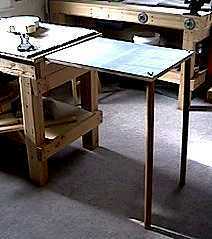 To support the table, I have a couple of legs which can be bolted to the table end with wingnuts. But wait . . . . there's even MORE changes ! ! !